Summary: Basically, toucans can can-can, and cockatoos in tutus, can too. 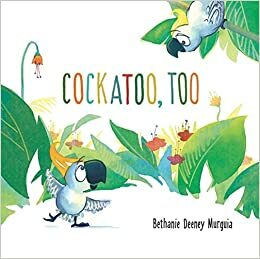 The word play never stops in this brief story, starting with a cockatoo, moving to two, then bringing in the tutus and can-canning toucans. Too. Paired with the fun illustrations, this is sure to bring giggles from young audiences. 40 pages; ages 2-7. Pros: You, too, can can-can like a toucan. Cons: The distinction between “Cockatoo two?” and “Cockatoo, too?” may be lost on a very young reader. A reader who is, maybe…two? Your site is very helpful for a single dad, so thank you. I know it’s a new book, but I just found a very nice book called “Cooking With Mr. C. by John Contratti. It has a wonderful message for kids. I found it on Amazon. My boys love it. I check out your site weekly, so thanks. Thanks! I love hearing that the reviews are helpful to people. I will look for Cooking With Mr. C…looks like it has a release date of February 2.